Come out for another fun night of Troosoul. Looking forward to DJing this August Edition with some of my favorite DJs, Cali and Chale Brown! *Quality Music + Good Folks + Good Vibes! 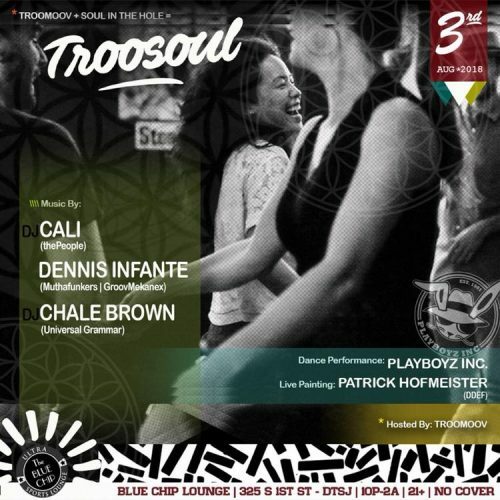  #TROOSOUL • Dedicated to Cultivating and Preserving Music + Dance + Creative Culture..
*Join In! Up next, the  continues… on the 1’s+2’s..
• Thomas Ramon Aguilar . = Dance Performance by:. .
= Live Painting by:. . Address: 325 South 1st St.
« 90’s Hip-Hop Class Wednesdays Moving to a New Location Starting Aug 1st!